While we focus on physical fitness, it’s easy to overlook other areas of our life. These dimensions determine our health and well-being. One of this dimensions, most overlooked, is our mental well-being. So, what can we do to keep your minds and souls in the best possible shape? The answer is to stay “happy” and a great way to start being so is to pursue happiness. It often feels like we are trapped in a vicious cycle, while trying to better our lives. We look at our neighbors and think, “Wow, I could own a flat screen TV too”or “It’s time I owned a new car too.” Thinking that doing so will make us content, we go out and buy these things. No doubt, they do make us feel good and blissful, until we realize, it’s only for a while. After a few months, everything feels mundane and old. What’s worse? Your neighbors have gone out and bought something better and exciting than before. You are back to square one. …The cycle for attaining happiness has started all over again. Another thing that we fixate on all the time, is finding ways to make more money. Why do we do that? It’s because we realize that money gives us the power to buy whatever we please. It seems to help us quench our thirst for unattainable happiness. But, ask yourself, “Does that make us happy?” You might say “Yes”, but, deep inside you know it’s temporary. We want happiness to last us a lifetime and there is a way to get there. 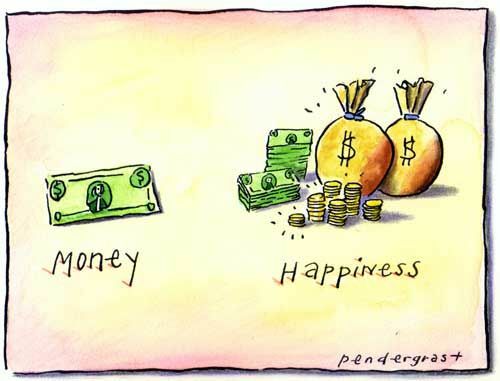 Money and worldly possessions, like we said, is not the answer. “Experiences” are. Research tells us that enjoying life-experiences is more effective in attaining happiness. But, why does this work so well? Part of it is because we are extracting ourselves a bit from that vicious cycle of pursuit. When do something that we like, it ends our chase and keeps our minds pre-occupied. More than that it ends our effort of having to keep up with the Joneses. We stop making impulse purchases of things that we would not even care about in a few weeks or months. Memorable and adventurous experiences bring along a number of special advantages. You cannot derive these advantages from material possessions. Whether it’s a vacation, a concert, or a sporting match, it intensifies our happiness. First, comes the excitement from anticipation of the event and afterwards the memories. These memories give us stories, to replay in our minds and share with others. The entire process enhances our lives while inspiring others on the way. Many other aspects of experiences become a part of us forever. A cooking class or a yoga class can enrich our lives as you continue to use what we learned. If we went to a concert or a game, we can always relive those good memories and share the stories for years. If we travel, our discoveries of about other cultures can change the way you see the world. Everything only expands our perspective and sense of possibilities. Experiences have unique value. They never become stale to us. Every time we experience something, it is fresh, new, and fleeting. It is a moment, which is special because it will never come again. This is the reason, experiences are especially delightful. Does this mean possessions can never add to your long-term happiness? Not necessarily, but it still does come back to experiences. Your material gains will only make you happy if you can continue to engage with them and create fresh experiences by doing so. If you want to learn more about how experiences can augment your happiness, check out the infographic below from InvestmentZen. At the bottom, you will find some suggestions for how you can use your money to purchase experiences instead of material possessions. Any one of these ideas is a wonderful way to get started on a path toward greater happiness!